Gift giving season is coming fast again. It might seem hard (for non-knitters) to think of a fitting present for your favorite knitter. Tastes vary, and there are so many yarns and accessories to choose from that it’s somewhat overwhelming. One thing that is almost always welcome however is a good book. 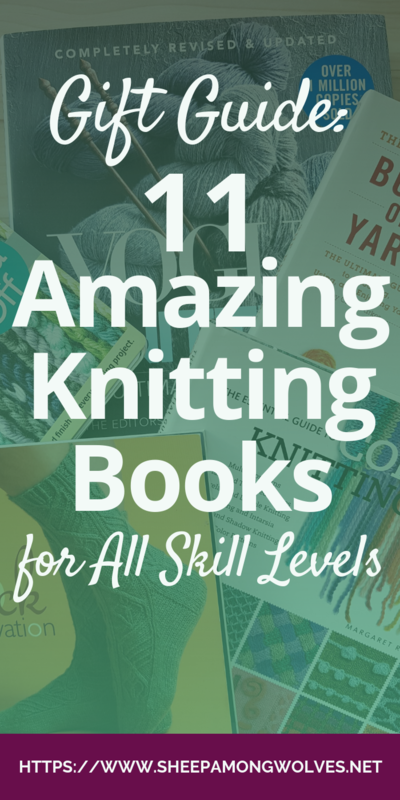 And there are plenty of awesome knitting books out there! I’ve made a short list of 11 great books (most of which I either own myself or have been wanting to get for a while) suitable for varying skill and interest levels. There should be something in there for almost everyone. Don’t forget: If you don’t know which books the receiving knitter already owns or you aren’t sure of their skill level and interests in the matter, gift vouchers are also always welcome! The Ultimate Knitting Book covers most things you may ever need from casting on to knitting in the round, passed understanding instructions and sweater design and on to fixing errors and so much more. It’s an extensive and detailed reference book with easy to understand instructions and images where they help. But it’s not just a reference book. I think it’s gorgeous, with a beautiful cover, great design throughout and color-coding. It’s fun to even just thumb through it. I think this book makes a great gift to any knitter. I got it as a present from my brother for my birthday. And I with my now 11+ years of knitting experience who is not afraid to try something new and scary (knitting-wise) can tell you that it still contains information valuable to me. I think most knitters would find something in there they don’t know yet. 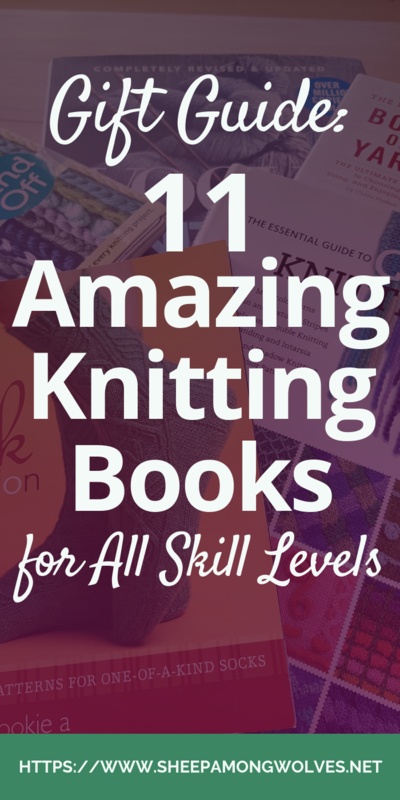 It can be hard to beginner knitters to find books that help them where they are at. I know this from other areas of my life. In programming, I often looked for detailed tutorials on how to do something instead of reference material. That usually helped me a lot better and faster to figure out how to do something than just piecing together bits of information here and there and lots and lots of trial and error. And it would have a lasting effect. It usually gave me a better understanding of a subject and made it easier for me to change and adapt it to my needs or even to do something different with a similar concept or structure. Knitty Gritty: Knitting For The Absolute Beginner seems to be just that. It teaches you by giving you projects to knit – like the classic beginner’s scarf – and shows you how to finish your project or even embellish it. This book is a good starting point for any aspiring knitter able to learn a new skill from a book. For those who need more visual aid or like to be shown how to do something: There are plenty of knitting how-to videos on youtube for free! I had to add a book by Stephanie Pearl-McPhee. She is a fun and insightful writer and just filled with knitting knowledge. Knitting Rules! is not only chock full of her unique brand of humor. If you don’t know her yet, go and read her blog. I have read every entry she ever wrote there (on top of all of her books) because I couldn’t get enough of her writing style. This book also holds a lot of useful information and tips and trick for knitters right from the treasure trove of someone with decades of knitting experience. And like I said, it’s a fun read cover to cover. I’ve linked to this book in any post I ever did on cast ons and bind offs. It’s just a great reference book for these techniques. The instructions are easy to understand and accompanied by helpful photos, and there is always a little bit extra information on what this cast on or bind off would be good for and such. It’s certainly doesn’t include all the ways to cast on and bind off there are. But it’s a fine starting point and contains a good variety of techniques. It doesn’t give you so many choices that you don’t know where to start but enough to try a few things out and make an informed decision. If you are still looking for more information on cast ons and bind offs there is also the book Cast On, Bind Off: 211 Ways to Begin and End Your Knitting (*) by Cap Sease that I’ve meant to get for a while. And of course, you can always google or search Youtube for more. Very few people out there know as much about yarn as Clara Parkes does. She spent a lot of time and effort accumulating this knowledge and has always been glad to share it with favorite fiber enthusiasts. She isn’t called the yarn whisperer for no reason! I’ve written a review of one of her books (The Yarn Whisperer) before. That was an enjoyable read (or listen in my case) whereas this one is all information. Lots and lots of excellent and valuable information about fiber and yarn. She covers natural and synthetic fibers, where they come from and their characteristics. How yarn is made and how spinning and plying will affect the resulting yarn and so much more. All this gives the reader the needed tools to predict how a yarn might behave when knit – or at least understand why it behaves a certain way – and for what types of projects it will be best suited. And which yarns might make good substitutes for one another, so you aren’t bound to the yarn chosen in the pattern you want to knit or negatively surprised by the finished project. It’s a great book for knitters with a bit of experience who want to understand why one knitted fabric is so very different to the next one even though the yarns are the same weight and have been worked up at the same gauge. Yes, another by Clara Parkes and it won’t be the last one on this list. I’ve added this one because it’s a companion to Book of Yarn. This one looks at the different kinds of wool and animal fibers and offers information on how to spin and ply those fibers. It’s more geared towards spinners than knitters – but a lot of knitters are also interested in spinning, so I thought I’d add it anyway. I know I’ve enjoyed spinning – and might again when the wolflings are older and stop playing with my spinning wheel. This is the last book by her, I promise! As an avid sock knitter, this book has been on my wishlist for a while. It contains a large number of fantastic patterns by well-known designers like Cookie A., Anne Hanson, Lucy Neatby, Ann Budd, Cat Bordhi, Norah Gaughan, Jared Flood and many more. But what sparked my interest in this book is the sizeable theoretical section as the beginning that teaches you about how different stitches can affect the elasticity and strength of a sock and – as expected of Clara Parkes – how fibers and various spinning and plying techniques might influence the sock as well. This would make an awesome gift for any knitters and aspiring sock pattern designers who love making socks and trying out different patterns, yarns and stitch patterns. And me, but I fall into that category anyway. 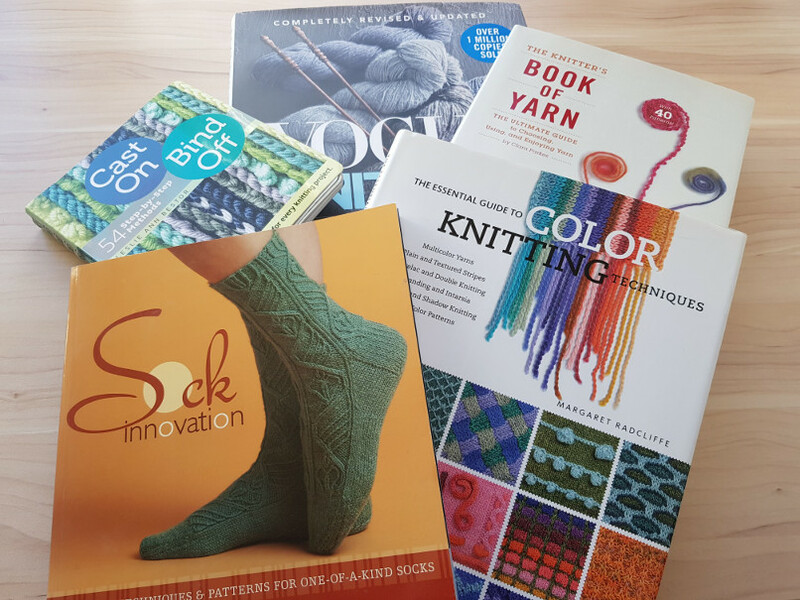 Sock Innovation is another excellent book for sock knitters and aspiring sock designers. It has a bunch of fantastic patterns by Cookie A, but what’s even better than the patterns is the theoretical part at the beginning. Aside from information on sock architecture and a few heel and toe options, it contains lots of valuable information on sock design. How to place stitch patterns, how to resize them and how they influence the fabric and so much more. This book finally made me realize why I had to use more stitches for cable patterns on socks and how to best add those stitches without getting a cuff that’s too loose. You should already know a bit about socks and be comfortable with charts. Cookie explains how to put the stitch patterns into charts and similar, but you should at least know how to read charts and have worked off of them before. I absolutely love this book and believe it’s a must-have for all knitters who love patterned socks and maybe are even thinking about designing their own. This is another book I’ve wanted for a while. I might buy this myself Christmas. It has a bunch of exciting designs and construction ideas for socks which is what interests me so much. I always love to try out different things and learn something new. And socks are a great place to do that because they knit up pretty quickly and I don’t have to wait so long to see how it’s going to turn out. I would say this book is a good present for more experienced sock knitters, who enjoy a challenge and patterned socks. I’ve owned this book for a while and though I haven’t read it cover to cover – I usually only out pick specific subjects with non-fiction books – I can tell you it’s a valuable resource for knitters. It doesn’t just explain fair isle knitting and how to choose colors and the color wheel and all that. It covers all color knitting as far as I can tell. Mosaic stitches, stitch patterns with one color per row, intarsia, entrelac, double knitting, and shadow knitting. But also knitting with variegated yarns, helix stripes, finishing techniques, and cast ons and so much more. It’s a great book to have for knitters who feel like playing with color a bit more and suitable for anyone passed the beginner stage. The AlterKnit Stitch Dictionary came out last year (I mentioned it here) and has been on my wishlist ever since. It has a good theoretical part explaining a lot about stranded knitting, chart reading (for color knitting), swatches, color theory, and steeks. But it’s a treasure trove when it comes to stranded knitting stitch patterns and motifs. I just love stitch libraries. So much potential, so much inspiration, so many ideas. And so many pretty pictures to look at that you completely forget what you were initially looking for. This would make an excellent present for anyone who likes to make up their own designs and does a lot of stranded knitting – or would like to start and doesn’t mind a challenge. What do you think of my picks? Can you think of another book I should have included? Which one is your favorite book or the one at the top of your wishlist? Please let me know in the comments below. For more gift ideas look at my post 5 Knitting Tools You Need to Begin Your Knitting Life or my Ultimate Knitting Needle Guide Part 1 and Part 2. Or if you’d like some yarn recommendations (and similar) look at the posts in the category Yarn, Yarn Shops & Dyers.